WASHINGTON (AP) – No score results yet, but students didn’t seem to be scared off by the new version of the SAT college entrance exam. The College Board, the nonprofit organization that owns the SAT, said Tuesday that nearly 1.4 million high schoolers took the newly redesigned SAT between March and June of this year. The board says that’s up about 180,000 test takers over the same period last spring. The new version of the test – with more of a focus on real-world vocabulary and learning – debuted in March. Some college advisers were a little cautious about encouraging students to take the debut test since it had a new format and wasn’t as familiar to students. The College Board says it won’t release average score results for the new SAT until next fall when it has a full year of data on graduating seniors for the 2016-2017 school year. The board says most 2016 graduating seniors, 90 percent, took the old SAT before its final run earlier this year. In the report released Tuesday, average scores for the 2016 class of seniors for the old SAT exam showed slight declines across all sections. The scores for graduating 2016 seniors were only reported through January of this year, when the old version of the SAT was last administered. For seniors, the mean reading score was 494 out of 800 possible points. That compares to a mean score of 497 in reading for the class of 2015, over the same period of time, through January 2015. Math showed another slight dip. The mean score was 508 for the 2016 senior class, compared to 512 in the previous year. And in writing, the mean score was 482, compared to 487 in the previous year. The top score in math and writing was also 800. Cyndie Schmeiser, chief of assessment for the College Board, says the pool of SAT takers has increased so there was a bigger and more diverse group of students taking the test. 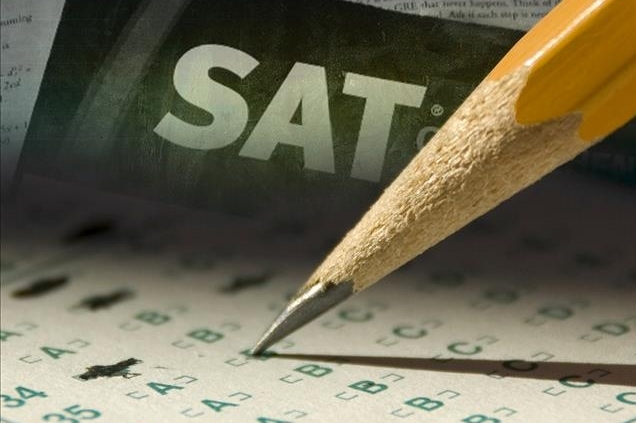 “What we do know is that in past years more and more districts have been offering the SAT to their students for free during the school day and this has resulted in a broader spectrum of preparation among the test takers,” said Schmeiser, in a call with reporters. The College Board made substantial changes in its redesign of the SAT. The exam still tests critical reading and math skills, but the essay portion is now optional. The redesign focuses more on areas of math that matter most for college and career readiness and shifts away from obscure vocabulary words that don’t typically find their way into most high school or college classrooms. On the new SAT, there’s no longer a penalty for guessing on a question. And, the top score goes back to 1,600 with a separate score for the essay, compared with the previous test’s total of 2,400 – 800 points for each of the three categories. Also new in the 2015-2016 school year: more tests from the College Board. The board began offering the new PSAT 8/9, geared to 8th and 9th graders, in the fall of last year. And this spring, it debuted the PSAT 10, aimed at 10th graders. The PSAT/NMSQT test, used to assess student performance and as a qualifier for National Merit Scholarships, also was redesigned and first administered last fall. About 42 percent of 11th graders taking that test met the board’s college and career readiness benchmark for the exam.